"He lived with the generosity of a good man and the simplicity which befits a great one." English surgeon, Fellow of the Royal Society, and discoverer of the scientific principles of vaccination and a vaccine for smallbox. 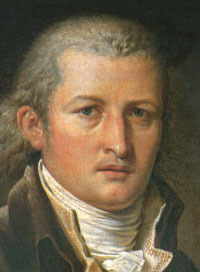 Edwards nephew, Henry Jenner, was Master for the first two years of the Lodge and later Provincial Grand Master for Bristol. Robert F. Jenner, Edwards son was Master of the Lodge in 1827, 1828, 1847 and 1848, while another nephew, the Rev. G.C. Jenner, was Lodge Secretary and Provincial Grand Chaplain for Bristol. Bro. Jenner attended his last lodge meeting July 14, 1822, six months before his death. At a memorial service held on August 23, 1823 the six Lodges of the Province raised funds to erect a statue of Dr. Jenner inside of the west door of Gloucester Cathedral.